How does zero to 100 km/h in a mere 4.3 seconds sound to you? 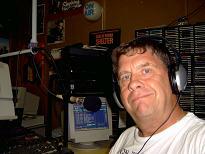 Be assured it sounds good to me and it feels good too! 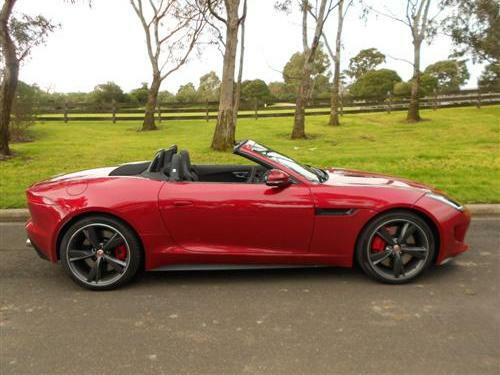 Jaguar's exciting F-TYPE convertible has been on the market for a year now and it is still turning heads as we discovered when we took another example for an exceptionally pleasing driving experience around suburban Melbourne and out into the hills of the western Gippsland region. The Jaguar Australia supplied test car came to us straight off the ship - well almost. 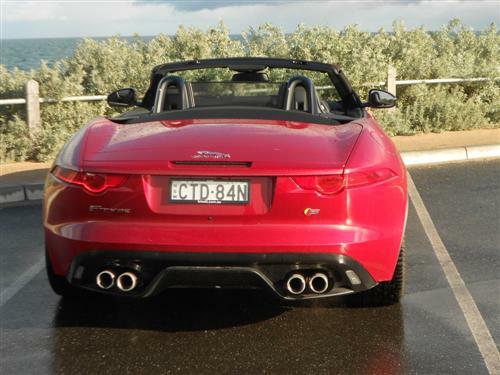 With just 43 kilometres on the odometer the car looked superb in its Italian Racing Red shade of paint. This optional colour is one from a wide selection. 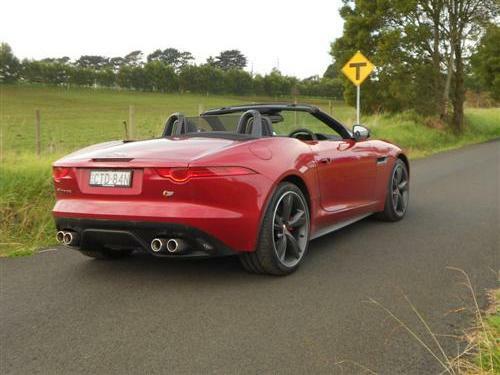 Our test car was the V8 supercharged superstar of the convertible line-up - the Jaguar F-TYPE V8 S.
The starting price* for the F-TYPE V8 S is $201,945*. The high performance test car came 'loaded' with various options. In fact, the options took the price* of the stunning test car to $233,970*. There is a wide choice of options so that you can acquire the right car for your personal requirements. 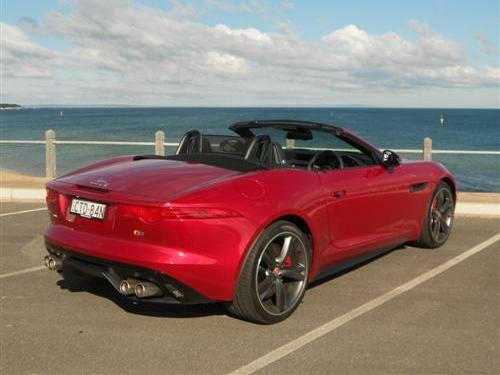 There are three versions of the Jaguar F-TYPE convertible on offer. Previously, we have indicated when choosing your F-TYPE you simply select 0-100 km/h in 5.3 seconds or 0-100 in 4.9 seconds or 0-100 in 4.3 seconds. Yes, it's your choice. The three models are, respectively, F-TYPE, F-TYPE S and F-TYPE V8 S.
To broaden the F-TYPE's appeal, the new F-TYPE coupe is also available locally having been released mid-year. It, too, comes in three variants - quick, very quick and amazingly quick! You will notice on your entry into an F-Type that this great sports car is low to the ground. That's the way it should be too! But having said that it is still easy to get in and out of this new Jag considering it is a sports car. All controls are right where they should be and pretty well everything is intuitive. The major control mechanism is the accelerator and it is more than willing to provide you all the excitement you should ever need. The seating is superbly comfortable for some-one with a average sized frame like mine. The designers have done an amazing job with the F-TYPE. There is no wasted space. In fact, there is just enough space to make it comfortable for the fortunate occupants. However, there is limited space for carry on luggage such as a diary and camera. There is no space behind the seats in the convertible. The F-TYPE is loaded with creature comforts and I always found each trip to be a pleasant encounter, even dreary errands are fun in the F-TYPE. 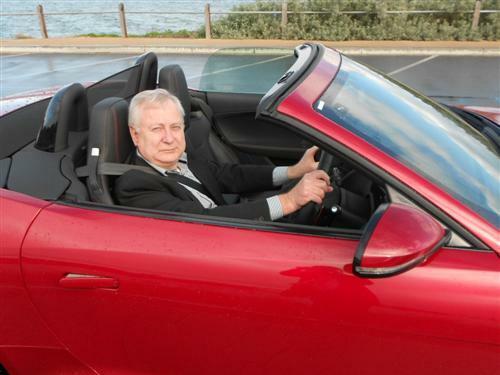 Like the previous F-TYPE I experienced I found I was chatting with keen admirers of the car on numerous occasions. Even a visit to an ATM can start a conversation about this stunning car! Our drive totalled 390 ever-enjoyable kilometres. During this time the top was up and the top was down to suit the occasion. 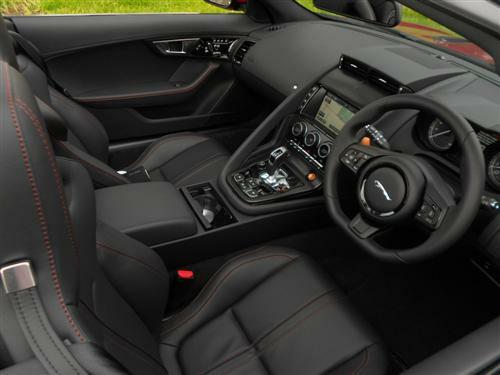 Top up provides little wind noise and the acoustics are a major plus for this Jaguar. The electric control for the hood is simple to operate and it is an uncomplicated process. The V8 S has a 5-litre displacement featuring supercharged efficiency. Power is rated at 364kW at 6,500 rpm and torque comes in at a whopping 625Nm at 2,500 to 5,500 rpm. The automatic transmission is an eight-speed unit. Being a 'real' sports car, rear-wheel drive is an important aspect of the F-TYPE. Dynamic stability control; anti-lock braking system; electronic brake distribution; front and side airbags are all standard as is other equipment. And there is a reversing camera and roll-over bars. 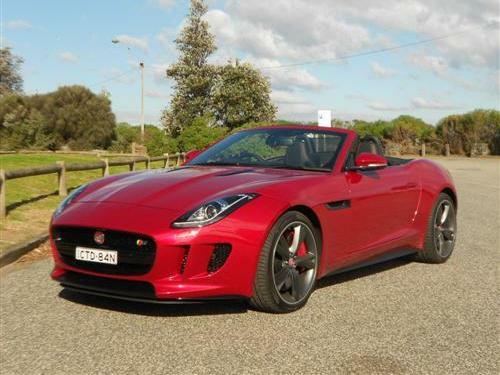 Consumption for the F-TYPE V8 S is rated at 11.1 litres/100 kilometres. The urban consumption is rated at 15.9 litres/100 kms. The on-board trip computer indicated our consumption was 11.8 litres per 100 kilometres. I were quite with this because our driving was balance of highway and local suburban driving equating to a near textbook case of "combined' motoring. The fuel tank capacity is 70 litres. An eight inch screen with navigation and the all important Bluetooth connectivity are standard. As is the ten-speaker sound system that includes a singe disc CD player. Three year/unlimited kilometre warranty is featured and roadside assistance is available for the length of the warranty (conditions apply to both the warranty and roadside assistance package). 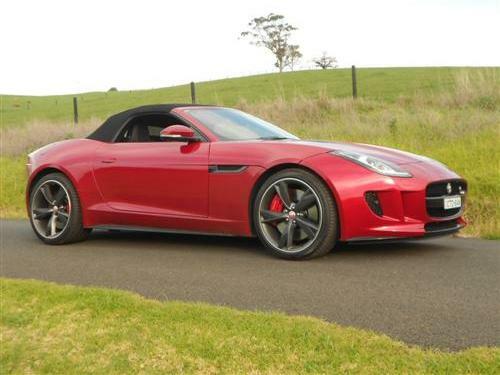 In the price bracket say over $175,000* to about $250,000* nothing comes close to the F-TYPE for appeal, in my opinion. Pick an accelerator's feel and price tag then enjoy the car because the Jaguar F-TYPE is an easily managed sports car that fully satisfies the driving enthusiasm that sports car drivers desire. And the Jaguar F-TYPE V8 S convertible is as good in an urban environment as it is on an adventure along country "B" roads. Top marks to Jaguar for this top sports car!